Ever since Angelina tea house opened in 1903, it has been a famous Parisian meeting place, where the main attraction has been the delectable pastries and mouth-watering desserts offered here. The hot chocolate and the Mont Blanc are the most loved and ordered specialties of Angelina tea house. The décor that was designed by the famous architect contributes to the charm and elegance of this renowned tearoom. This décor creates a space of quietude, where calm and refined ambiance prevail, which are one of the key things that one looks for when visiting a high-profile restaurant. Angelina tea house is Belle Époque style tea salon which is extremely popular among tourists. Since it is widely recommended by travel guidebooks, it is unavoidable to wait in a queue to step through the door of Angelina. However, if you are looking for the best hot chocolate, superb French pastries, good food selection, and do not mind paying just a little more, then a visit to Angelina has to stay in your to-do list, during your trip to Paris. When you reach Angelina tea house, you can enjoy their best-known specialties, LeMont Blanc, which is a pastry made with marron glace’, and their old-fashioned hot chocolate. Both have been famous since decades. You can also try out the selected variety of teas that is offered here. 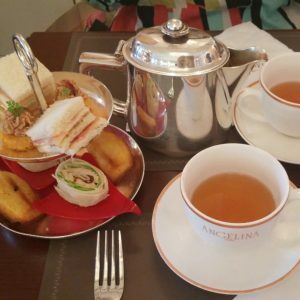 Do not miss the chance to have a brunch, snack, breakfast or even a lunch at Angelina Tea House, during your next Paris visit.